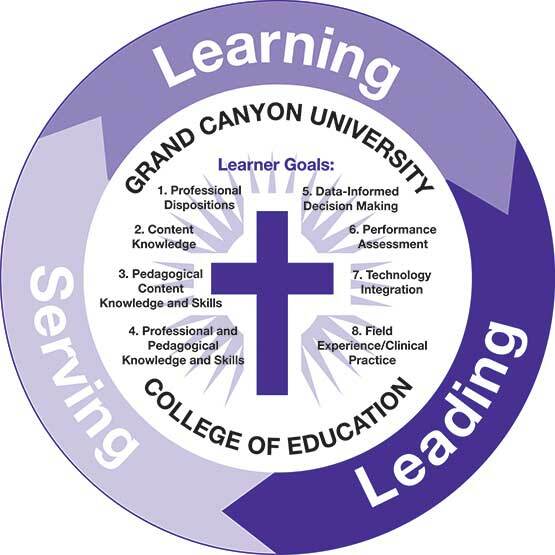 Grand Canyon University's (GCU) College of Education provides you with essential knowledge and in-demand skills required for the challenging, diverse classrooms and district initiatives of 21st-century education. All teaching and education degrees align with national and Arizona Department of Education accrediting standards. Whether you dream of earning a teaching degree in early childhood education, special education or secondary education, you can gain the knowledge, skills and confidence needed to achieve excellence as a teacher or administrator. Learn more about our college, including available degrees and program locations. Enter my class as a professional educator, fully prepared every day. Maximize learning for all students, inspiring them to achieve at their highest potential. Approach teaching and learning for all students with the heart of a servant leader. Be a culturally responsive educator, engaging with and advocating for social justice, and supporting each student and their unique learning needs. Model personal integrity, professional ethics, collaboration and excellence for all. Be a lifelong learner to advance my commitment as a professional educator. This pledge is made to affirm my commitment and devotion to learning, leading and serving. Get timely information on current events in education and insightful monthly topics from the College of Education's blog, Teaching in Purple. Our blog features posts from students, staff, faculty and guest writers to give a variety of insights into the world of education. GCU and the College of Education promise assistance to any graduates of our teacher and principal preparation programs who are experiencing difficulty in their first year of teaching or leading. Believing in the excellence of our programs, we will provide assistance to any graduate recommended by GCU for teaching or principal certification. In 1984, GCU and the College of Education began offering graduates of our licensure programs assistance when needed at no expense to the school district or to the teacher/principal graduate. The need for assistance may be requested by the GCU graduate, the principal or the superintendent. The appropriate assistance will be determined by the College of Education and can range from the graduate taking a refresher course in the area of difficulty to receiving mentoring by faculty who will coach in such areas as curriculum planning and design, classroom and time management, content presentation and individualized instruction. To submit a request or for questions about the College of Education Promise, email us at COEpromise@gcu.edu. GCU's College of Education is dedicated to providing opportunities for candidates to develop professional dispositions while learning, leading and serving their community. The College of Education inspires excellence in pedagogy and scholarship through the development of servant educators. GCU's Alpha Epsilon Gamma Chapter of Kappa Delta Pi International Honor Society in Education is the premiere honor society for people who are preparing for, engaged in or retired from the teaching profession. Discover how the honor society can help you grow in knowledge and professional development. The iteach program helps prepare educators for success in the classroom through online learning and in-person mentorship. If you have completed the iteach program, you may be eligible to transfer credit hours towards one of the education degrees at GCU. Find out more about eligible degree programs. If you would like to request additional information or determine eligibility, or if you have questions regarding this program, contact us at azteachinginterns@gcu.edu. For resources and more information, please visit the Student Success Center. Knowledge in the field of education is expanded when we have information at our fingertips. Clicking on any of the links below will open up the world of education to you. Here, you can probe state and federal departments of education; investigate education career prospects; quick link to professional and content standard organizations; and discover professional development opportunities. Happy exploring! The following information provides you with College of Education essentials that will be important throughout the course of your program. It is important to become familiar with the following topics so that you can properly prepare for your education courses. The College of Education embraces standards and principles set forth by the Arizona Department of Education, national accreditors and many educational organizations. Students in the College of Education who are seeking Institutional Recommendation (IR) complete a benchmark assessment. In the non-IR track, students complete a signature assignment to better understand specific professional standards that are applied within their coursework. College of Education students who are in pursuit of IR must pass their state-specified basic skills and content area exams before the start of their student teaching assignment. The three-part test involves reading, writing and math. Most states, including Arizona, also require you to take a professional knowledge exam to achieve certification. You may sit for this exam at any time in the program and even during your student teaching assignment. It is a requirement for IR, so please visit your state's department of education website for more information. For more information on state testing and certification, contact your field experience counselor. Browse through our exam resources by visiting the Student Success Center. GCU provides you with the opportunity to be involved in a student teaching/credentialing program, but does not guarantee certification. Because the programs are accredited in the state of Arizona, the College of Education follows its IR verification process for successful program completion. Having completed coursework and its related practicum/field experiences as well as passed state-mandated exams, you are now ready to move to the next progression point in your program: student teaching. At this point, you acquire the designation “teacher candidate.” The capstone experience for the education programs consists of a 16-week guided student teaching experience designed to provide opportunities for you to apply your knowledge and skills as identified in national standards and research. Student teaching is the culminating experience in your academic program of study. It is an exciting, yet challenging, learning experience that places you in unfamiliar situations, affords intellectually stimulating activities and allows for empirical application of concepts and skills learned. These experiences are offered through scaffolding that includes observation, participating and actually leading activities. During student teaching, introspection, personal change, professional growth and self-assessment empower your sense of development as a professional. The opportunity to work as an independent practitioner within the field coupled with supportive mentoring from the mentor teacher and faculty instructor provide a strong sense of the exciting opportunities that await you in the coming years. For resources related to your practicum/field experience, visit the Student Success Center. Professional education programs at GCU are designed to support and promote the university's mission to prepare learners to become global citizens, critical thinkers, effective communicators and responsible leaders from the context of its Christian heritage. The College of Education inspires excellence in pedagogy and scholarship; advances reflective, innovative and collaborative teaching practices to maximize student learning and achievement; promotes servant leadership in educational communities; and engages a diverse and global community of learners with purpose and passion. Learning: We believe that all students can learn and that highly effective, innovative and collaborative teaching and administration maximizes best practices as well as student learning and achievement. Effective teachers and administrators are highly educated, skilled, committed and compassionate; they ensure all students learn to the best of their ability. Leading: We believe that education is a powerful tool with which to purposefully engage a diverse, global community. As our teacher and administrator candidates find their purpose and calling within education, they seek to lead others to reach their God-given potential in order for them to influence the changing world. Serving: The culture and Christian heritage of GCU promotes a spirit of servant leadership within the College of Education's faculty, staff and students so they can serve people within the broader educational community. Prior to your participation in any practicum or field experience at GCU, you must submit a copy of an official Arizona Fingerprint Clearance Card or the official results of your federal fingerprint background clearance from the Department of Public Safety or a comparable agency in your state of residence. This documentation should be sent to a field experience counselor for your state. If you are seeking Institutional Recommendation in Arizona for a teaching or administrative credential, you must have both an Arizona Fingerprint Clearance Card and fingerprint or background clearance documentation from your state of residence. A practicum or field experience is an exciting learning opportunity that affords you the chance to observe and participate in diverse educational settings, and to apply the theories and concepts learned in program coursework. Faced with the challenge to meet the needs of PK-12 students in low performing schools and the national movement towards 21st century learning built around standards, a practicum or field experience affords you the unique opportunity for introspection, personal change, professional growth and self-assessment, all of which empower a sense of development as a professional. The opportunity to work in a practical setting within the field, coupled with supportive guidance from a GCU instructor, provides you with a strong sense of professional self-reflection. Next to the teacher in the classroom, there is no person more important to the success of a school and the students enrolled at that school than the principal or school leader. Research and literature continue to show that the principal is critical to creating and sustaining a school climate and culture that is conducive to both student learning and quality teaching. This program of study has been designed to present you with a comprehensive continuum of learning opportunities based on current research findings, expert literature and proven best-practices that are based on the ISLLC 2008 Leadership Standards and Functions. The need to prepare school leadership capable of bringing about change designed to improve student achievement is paramount to the continued success of the American educational system in the 21st century. The College of Education teacher and administrator preparation programs are designed to ensure that you aspire to a set of personal and professional goals that will enable you to be an educator focused on student learning and achievement, as a direct reflection of the college's mission and the above NBPTS policy statement. These eight goals are reflective of standards espoused by state and federal departments of education, professional education organizations and accrediting bodies. For GCU College of Education students, these dispositions flow from the university's mission statement. A values-based education emphasizing community, character and citizenship in the context of a Christian worldview seeks to teach, reinforce, support and cause teacher candidates to contemplate certain foundational values which Christianity contends lead to a good life. These normative Christian values are integral to the development, maturity and education of ethical and morally respectable citizens who continue on the path of lifelong learning and service. For College of Education students, this is manifested in the professional dispositions each carries into the educational community. The purpose of clinical practice experiences is to help prepare innovative, reflective and creative professional educators with high ethical and moral standards who have the understanding, attitude and skills necessary for effective teaching. Through clinical practice, teacher candidates observe and participate in field experiences in diverse educational settings and apply the theories and concepts learned in program course work. Browse through our resources by visiting the Student Success Center. For more information email us at coe@gcu.edu.